Hello and welcome to another edition of Sealed Success! The paper Prerelease was this past weekend and I had quite a fun time playing Ravnica Allegiance and seeing how all the guilds worked in paper as opposed to theory. I went Orzhov in all 3 flights I entered since I was chasing Magali Villenueve cards and I was rewarded with a 10-2 record overall (3-0, 3-2, 4-0). Now, I didn't go straight Orzhov for all three flights, I had a blue splash in two of them and a red splash in the other since I had the cards powerful enough to make a splash worth it. For my 3-2 deck I had to go the hard blue splash with 0 guildgates, 0 lockets, and 3 basic Island s. That deck in particular was not very strong and needed the blue cards to make it viable, but I had to commit to the hard splash in order to make it work. There are times when a hard splash is necessary, usually this is when you want to maximize your chances of winning but lack the power to do it in a straight 2 color deck. I remember an article write up from Cedric Phillips years ago when he was presented with a pool in M13 Limited at a Grand Prix and had the option a under-powered 2 color deck or a more powerful 3 color deck. Given his goal of winning as many matches as possible to make Day 2, he opted for the more powerful deck with a bad manabase and it payed off for him. This won't always work out and you'll lose some games due to mana but you should always make the best decision based on the goals you have in mind. My goal was to win as many matches as possible and I would be doing myself a disservice if I played a weak Orzhov deck. As far as the matches went I felt each guild had a chance to play the games and be in them, save for Rakdos if it got off to a slow start. 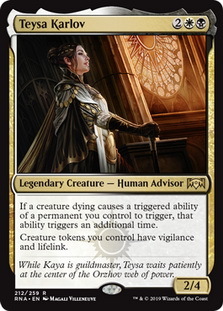 Some of the Rakdos cards are only good early and if you draw them late and the game is still going on then they don't do much for you. Addendum felt weird since it didn't always come up that you wanted to play a lot of Addendum cards because you at some point needed to play creatures. I don't think there's an Addendum deck out there, you're looking at a U/W Skies/Tempo deck with Addendum cards added to the mix. As for Riot, Adapt, Spectacle, and Afterlife I do believe you can build decks around those keywords and they be fully functioning decks. While I normally do a draft video when the set soon comes out, I haven't played all the matches by the time the first article with the new set is live. Normally I wait a few days to play the matches and use the fresh knowledge to immediately go into another draft and try to improve on my previous draft. This time I wanted to get the first draft in right away to see what it would be like to play while everybody else is working with relatively limited (pun intended) experience. The draft portion I thought was really interesting as I took Simic Ascendancy first and ended up in Orzhov after taking a late Syndicate Guildmage . 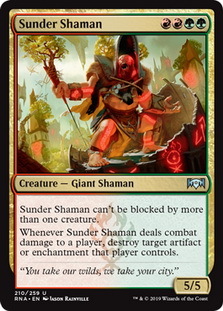 You could either take Simic Ascendancy or Sunder Shaman first and it comes down to which one I thought had the most upside and I figured it would be Simic Ascendancy . It's a great mana sink plus an onboard combat trick at the same time, and it makes sure your creatures can be as big as whatever your opponent is doing. Sunder Shaman is a good rate card with a good ability but it's just a 4 mana 5/5 at times. 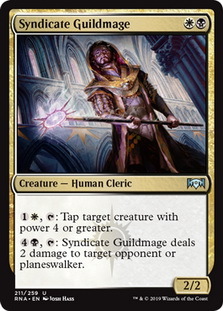 I took a Syndicate Guildmage out of an empty pack and noted it was there since if anybody to my right was in Orzhov they would surely have taken it already, so if I saw more Orzhov cards I already had a reason to take them. 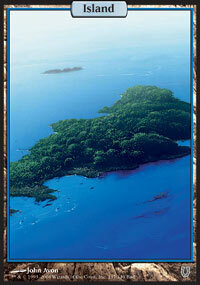 Sure enough I got a Revival/Revenge 8th pick and that was enough to push me away from Simic. Pack 2 gave me a first pick Seraph of the Scales and then with my 4th pick in the third pack I was able to pick Teysa Karlov to give myself three good Orzhov rares in my deck. This was a draft where I got rewarded by taking a speculative pick early and having the discipline to go from one 2 color pair into another. Usually you switch one color and go into another guild so I was far more likely to either go Gruul or Azorius if I made a switch, instead I went into Orzhov and it paid off with a 3-0 performance in the draft. I will admit I got lucky winning games with some of the hands I kept, but I had a feeling I would draw the other color of mana I needed and I would be golden. 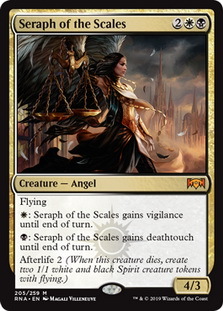 The best strength Orzhov has is Afterlife and the ability to grind your opponent down by forcing them to make uneven exchanges all throughout the game. Undercity's Embrace is laughably bad against Orzhov and when it was played against me in the first match I felt as though I was making my opponent discard a card while I lost almost nothing. The downside is your creatures are a bit small and if you can't back up your creatures with removal then you might run into Simic or Gruul and lose because you can't block well. I chose Simic for my guild as I do think Adapt is a fun mechanic and the Simic creatures are just so fun to say and have on the battlefield. In practice building with a seeded pack almost takes all deckbuilding decisions away from you. Choosing Simic means my seeded pack will have 15 cards ideal for a Simic deck, so right off the bat 1/6th of my pool wants me to play Simic. In all actuality it's more like at least 1/3rd of your pool will be cards that are good with your guild, so more likely than not you play the guild you picked. I have at least 30 cards that are in Simic colors, so it stands to reason that I'll be playing a Simic based deck going into the matches and based off the decks I built that will certainly be the case. 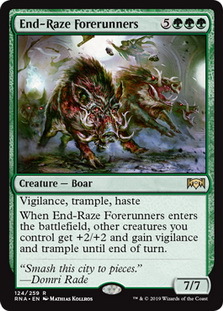 There are too many cards in Simic to pass up and I have 3 rare cards I want to play: Simic Ascendancy , End-Raze Forerunners , and Domri, Chaos Bringer . The other guilds aren't deep or powerful enough to make me pivot away from those three cards so I'm left with the option to play straight Simic or splash red for Domri. 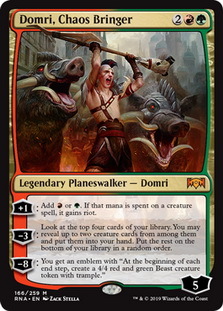 I think Domri is a powerful enough card to splash so I'm likely going to be Simic with a red splash to start out the guilded league. What do you think? What would you build? Some pools you lay out by color and you realize you can only really play a certain deck due to the number of cards you wouldn't have access to if you took out those colors. If I choose not to play Orzhov I'm not playing with close to half of my cards, meaning the other half needs to be really good for me to find 23 cards worth playing. As it is my other cards are not good enough to make a deck work so I must play Orzhov if I want to have the best chance at doing anything in this league. Of course, the problem here is Orzhov is not very deep or powerful so I don't have the best way to win games if I choose to play Orzhov. 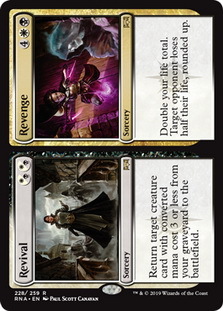 I have two choices here: play straight Orzhov and be okay with playing a medium deck or play Orzhov with a red splash to try and improve the power level of the deck. Adding red does make my deck stronger in the abstract but I'm not sure it does enough to give me a good chance at winning games. The base Orzhov build is pretty underwhelming so adding colors and making it less consistent isn't the ideal solution here. Even if colors weren't an issue I don't think the best 23 spells in my pool would be good enough to make a strong deck, which speaks to the strength (or lack thereof) of what I'm having to work with. What do you think? What would you build? I'm quite happy I went 3-0 in my first draft of the format but I'm not going to let my ego get inflated and suddenly think myself a master of the format. I could have drafted Orzhov better once I was in it so I don't think I had the ideal build of the deck even after the draft was over. There is always room for improvement and I know I could have made better decisions in the games so I wouldn't have had to play more than 6 games for the entire draft. My sealed pools are a bit straightforward which is nice in a sense but a lack of options is not the best situation to be in at times. We'll see how the leagues turn out but I don't have high hopes for my competitive sealed league. I have more than enough experience with decks to know if a deck has a winning record or not, and sadly I don't think any deck I make will have a 3-2 record. If you have any comments, questions, or concerns leave them in the comments section below.